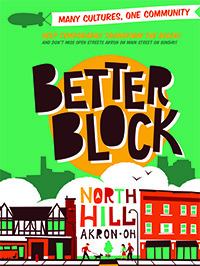 By now, you’ve likely heard about the Better Block event that takes place next weekend in the North Hill neighborhood of Akron, but this program is much more than the sum of its parts. Better Block’s an exercise in civil disobedience and imagination. It’s also a look ahead at what a neighborhood could be. And while it’s happening in North Hill this time, it could happen in your neighborhood, too. 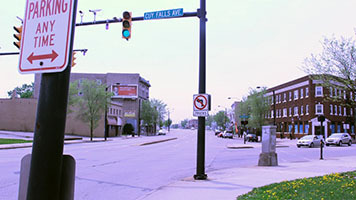 On May 15 through 17, the “Temple Square” block in North Hill (the intersection of Cuyahoga Falls Avenue and North Main Street) will be adorned with temporary landscaping, bicycle lanes and popup businesses in currently empty storefronts, along with live music, art, an open air market and a number of other attractions. Better Block is a community development tool started in Texas five years ago that has since helped cities across the United States revitalize their underused neighborhoods. Now, Team Better Block and Knight Foundation are partnering with neighborhoods in Akron to bring this open-source program to a local level. Bike Friendly Oak Cliff, Go Oak Cliff and Art Conspiracy. There are dozens upon dozens of moving pieces (and the North Hill Better Block team is still in need of community volunteers) but the concept is simple: an entire community envisions “what could be” for a brief time, to show what development could look like. Although civil disobedience is a part of the program (because the original Better Block temporarily skirted local zoning ordinances), city officials are usually supportive. Better Block is about trying to “activate spaces,” say many we’ve spoken with about the event. The Ughrins point out that true grassroots improvement must come from the citizens themselves, not the government or outside entities. They were so inspired by a conference last year centering around bicycle culture that they took a look at the Temple Square intersection and decided this would be an ideal block to re-imagine. 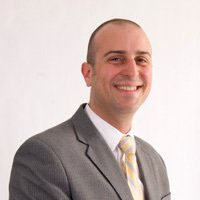 “In June, Knight Foundation brought Jason Roberts (who started the first Better Block in his Dallas, Texas neighborhood) to Akron for ‘Switching Gears,’ an active transportation conference sponsored by my organization, the Akron Metropolitan Area Transportation Study,” writes Jason Segedy, director of AMATS, in his blog. “The premise of Jason’s work is to start small, with one block at a time, and to actually do something. It could be temporary new bike lanes; it could be temporary street art or street furniture; it could be a makeshift coffee shop, or art gallery or beer garden. The spirit of Better Block is about improving our city one block at a time, John Ughrin points out. What’s most important is the exercise in teamwork, as the current bustle in planning North Hill’s event attests. Tina Ughrin says Better Block represents a new way of doing things — more action, less talk — following the style of some millennials, who band together and quickly and efficiently work toward solutions. A number of initiatives launched by Akron’s younger generation have had immediate and positive impact, like the popular series of Akron2Akron walking tours. It’s also an example of “distributed vs. hierarchical,” leadership, says John Ughrin. “You don’t really have a gatekeeper.” Although the Ughrins are at the helm of planning, they stress that Better Block is a group effort. But Better Block goes far beyond the North Hill neighborhood. This program is a way for residents to use their imaginations to see what their neighborhoods could become. With the proper community champions, this could happen in any neighborhood in our city. 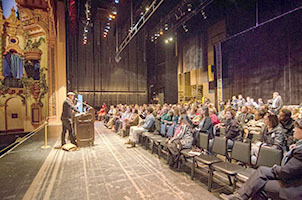 addresses residents at the Akron Civic Theatre in February. Roberts started the program as a way to improve his own neighborhood. If you’d like to plan a Better Block in your neighborhood, the event should reflect the character of your area. North Hill is an ideal candidate to kick off Akron’s Better Block events, as this neighborhood is going through its own reinvention. Streets that were once deemed unsafe are now walkable and vibrant, with families, community gardens, new restaurants and markets, reflecting the growing refugee and immigrant population. 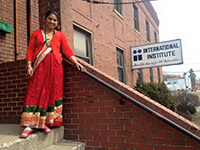 The International Institute of Akron (IIA) is pivotal to this neighborhood’s growth. The agency, along with Global Ties Akron, will set up a temporary international welcome center at next week’s Better Block. Also at the event will be an open air market plaza, civic science center, popup bicycle shop and an espresso bar and art gallery, along with a number of start-ups, many of them socially focused organizations, like Neighbors Apparel, a clothing company that employs local refugee women. 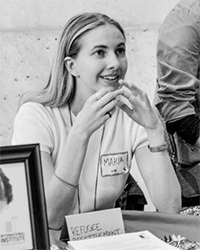 Maria Mancinelli, IIA’s Community Outreach Coordinator, has been at the forefront of this neighborhood’s blossoming refugee and immigrant population. The Ughrins point out that some misunderstanding still surrounds our city’s growing numbers of refugees and immigrants. John Ughrin says he remembers a time when there was more crime in North Hill, but he thinks the neighborhood is safer now. Refugees and immigrants are in fact opening businesses and putting more money back into the local economy, he adds. They’re also sharing art, music and culture, growing local gardens and improving their neighborhoods. Adds Tina Ughrin: “We’d love to see North Hill thrive and see some of those popup shops become permanent shops. How do we start to integrate into an already vibrant neighborhood?” Also, how do we increase the social capital of our neighborhoods, she posits. Mancinelli points out the numerous walking tours that have taken place in North Hill over the past six months, which has introduced residents to new businesses and new views of North Hill landmarks. 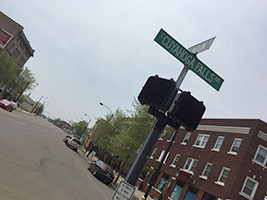 Although a popup International Welcome Center will be among participants at next week’s Better Block, Mancinelli would like to see a permanent welcome center emerge in this area of the neighborhood. Segedy says this Temple Square block in North Hill, built around past streetcar routes, could really catalyze this neighborhood in following years. The intersection is currently too wide, which doesn’t make it pedestrian or bicycle friendly. The Ughrins say they hope to see a residual benefit that extends for at least a couple years. Developers and business owners could potentially be encouraged to fill some of these vacant commercial buildings after the Better Block event. Tina Ughrin says that in other cities, roads get narrowed, sidewalks get repaired and traffic accidents go down. Other Akron neighborhoods eyed for Better Block are Kenmore, Firestone Park and Highland Square. But the Ughrins stress that each Better Block should have its own self-contained volunteers, and other neighborhood champions need to step forward. Although the North Hill Better Block involves more planning time than the model that’s typically followed (the typical planning period is only a few months), this one could be looked at as a pilot for other neighborhoods. And Segedy stresses that he nor Jason Roberts, nor the North Hill planners, should be at the helm for other neighborhoods’ Better Blocks. “You really need to have people in the neighborhood engaged and willing to kind of carry the ball,” he says. So, Akron. The ball’s in your court. Is your neighborhood a good candidate for Better Block? Enjoy the North Hill event next week, take notes and contact Team Better Block to plan one for your neighborhood. One of the most important lessons Better Block can teach us is, this can be your neighborhood. What makes you unique? What makes the people in your neighborhood unique? North Hill Better Block still needs volunteers. A number of workshops will take place next week. Click here for more information or to help plan your own Better Block event, contact info@teambetterblock.com. Visit teambetterblock.com/akron to learn more. This entry was posted in Community, Neighborhoods, Uncategorized and tagged Akron, Akron Neighborhoods, Akron News, akron nonprofits, Akronist, Better Block, International Institute of Akron, Jason Roberts, Jason Segedy, Knight Foundation, Kyle Kutuchief, maria mancinelli, Neighborhoods, nonprofits, North Hill, Places, Team Better Block, Urban Planning. Bookmark the permalink.